Trevor Noah interacts with students as they demo the microsoft digital literacy content. 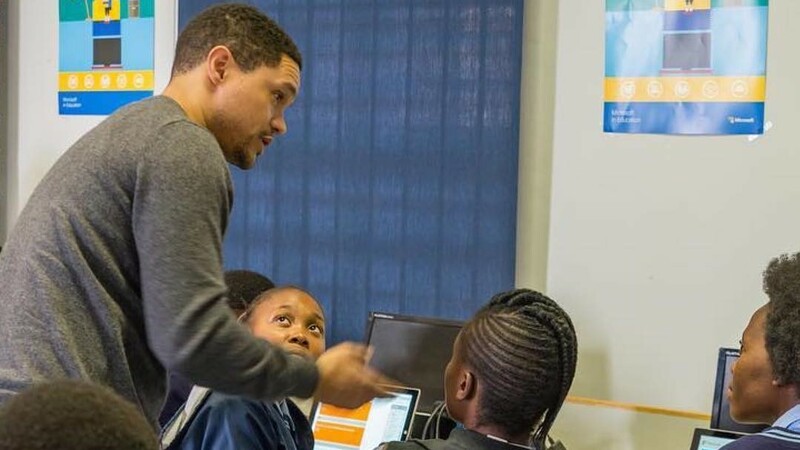 Microsoft has partnered with South African-based Trevor Noah Foundation (TNF) to provide digital skills to underprivileged youth in a Johannesburg suburb. Under the partnership, Microsoft’s philanthropy arm will help incorporate technology into classrooms activities at New Nation School in Vrededorp. The government-owned school caters for orphans and children who find themselves outside of the traditional family structure. Sensational stand-up comedian Trevor Noah recently founded the TNF which focuses on equipping orphans and vulnerable youths with education, life skills and social capital necessary to pursue further opportunity upon graduating high school. 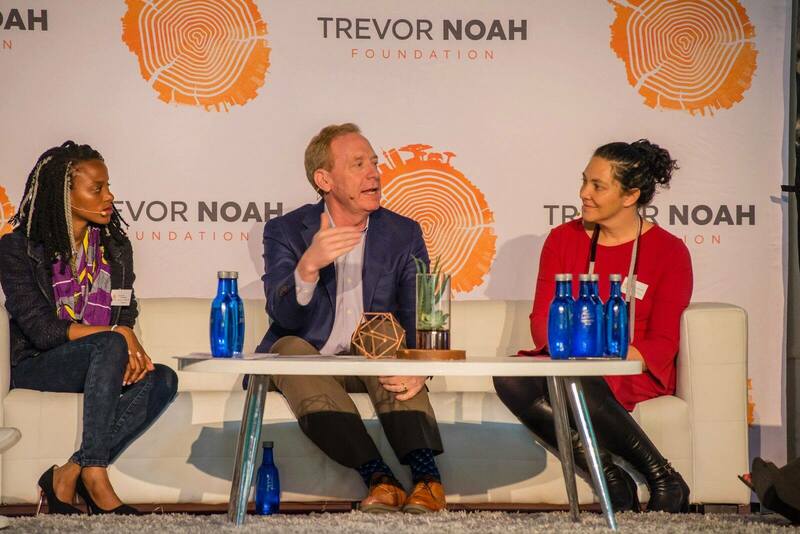 “We hope to drive sustainable change that improves the lives of the most vulnerable youth in South Africa” says Mr Noah, who is also author of Born a Crime and host of The Daily Show on Comedy Central. Microsoft’s philanthropy arm empowers people around the world by providing digital skills, knowledge and opportunity so they can achieve more. Currently it has donated over $1.4 billion in cash grants and technology, supporting over 200,000 nonprofit organizations around the world. Microsoft believes economies and societies are being rapidly transformed by technology, making the need for digital skills very essential to the jobs of today and tomorrow. “One of the greatest challenges we face is ensuring everyone has access to the skills and knowledge they need to succeed. 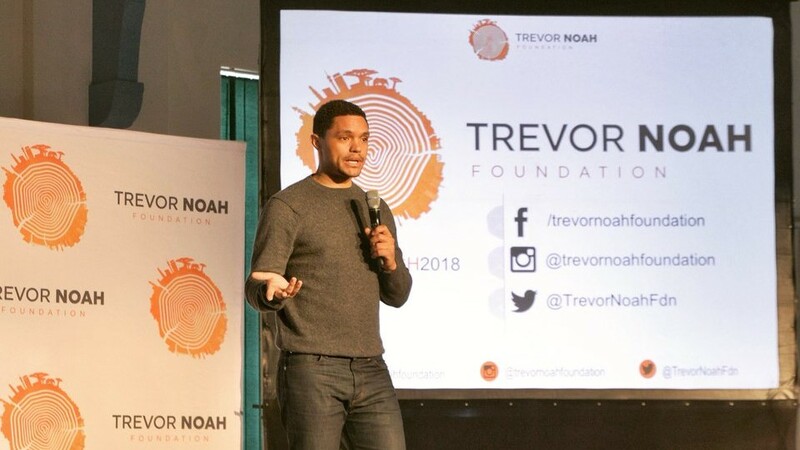 The Trevor Noah Foundation will scale up the program after the current pilot across the nation. The foundation also believes that with Microsoft as the Foundation’s technology partner, under-resourced schools will have the opportunity to use technology as a tool to enhance the learning experience in classrooms. Beyond the classroom, digital literacy is a life skill that will continue to add value as the student transitions into further education, or their first job.